A designer and researcher has pioneered a new form of fabric which promises to revolutionise the textiles industry. Sonia Reynolds invented 'space cloth' – the first non-woven material made from yarn. 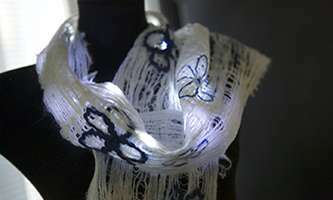 It has a strong potential for use as a smart textile due to its unique structure with space to encase copper wiring, light emitting diodes (LEDs) and more. Ms Reynolds brought the idea to Nottingham Trent University's Advanced Textile Research Group and is now undertaking a PhD in the subject to further develop the fabric's novel manufacturing process under the direction of Professor Tilak Dias and Dr Amanda Briggs-Goode, of the School of Art and Design. Scientifically named Zephlinear, unlike traditional woven or knitted materials which are made by the interloping or interlacing of yarns, it is made by a newly established technique known as yarn surface entanglement. Ms Reynolds said: "This is a real breakthrough for the textiles industry. It's the first non-woven material made from yarn and promises major benefits for the future of clothing, and more. "Because of the material's linear channels of yarn, it has great potential to be used as a smart textile. In particular, we believe it lends itself well to being embedded with microcapsules containing medication or scent, to either help deliver drugs to specific parts of the body or to create antibacterial and aromatic clothing. "As the material is visually different, it has potential to be used for other applications as well, such as wall coverings, in addition to clothing. "And because it's much less labour intensive to make than knit or weave fabrics, it's a more environmentally friendly material to produce as well." The name, Zephlinear, derives from the merger of two words, zephyr and linear. It was given the nickname 'space cloth' due to its appearance and its e-textile capabilities. The material – which is patent pending – was recently presented at the Wearable Technology Show, USA, by Ms Reynolds. Research shows that it is strongest and most efficient when created from natural yarns such as one hundred per cent wool, hair and wool/silk mixtures, though it can also be made from synthetic yarns. Professor Dias, who leads the university's Advanced Textiles Research Group, said: "Zephlinear is a remarkable development in an industry which is advancing at an incredible pace. "We believe it has huge potential for textiles, and we have already found that it combines well with e-textile technologies such as heated textiles or textiles with embedded LEDs. "As a fabric it is very lightweight and flexible, and it retracts back to its original shape well after it has been stretched. "We're very much looking forward to developing the material further and feel certain that it will help provide people with smarter and more environmentally friendly clothing in the future".